When we go to the theatre to see a movie or watch a hockey game at the arena, it is easy to forget all the behind the scenes work needed to make those events happen. Seeing the groomer sitting in the parking lot or paying the trail fee at the kiosk is usually the only time we will ever see evidence of all the hard work that goes into making a snowmobile tenure happen. The effort of running the Golden Snowmobile Club is volunteered, and with family, work and other ‘life ‘priorities, finding the time to manage back room club business goes un-noticed. The Golden Snowmobile Club has been around for a very long time and was started by local enthusiasts as a way to network and socialize with other likeminded individuals in the community. The boom that the snowmobile industry is undergoing has forced a change in the agenda of the club; with upwards of 230 snowmobilers in an area per day, grooming the trails is no longer a volunteer job—it would be impossible for someone to find the time and resources to groom Golden’s three managed areas ten times a week. Luckily we have Fast Cat Grooming taking care of our trails, and doing a fine job given the less than spectacular snow conditions we have been having. It is very hard on the equipment to operate it the soft snow but I can assure you Fast Cat is doing everything they can to provide the best grooming possible. Currently the club is working toward opening new areas for riding and grooming more trails, as well as building more cabins. This is all being done thanks to the hard work of the club’s Board of Directors to obtain grants from the Columbia Basin Trust. Our three maintained sledding areas are Quartz Creek, Gorman Lake, and Silent Pass. 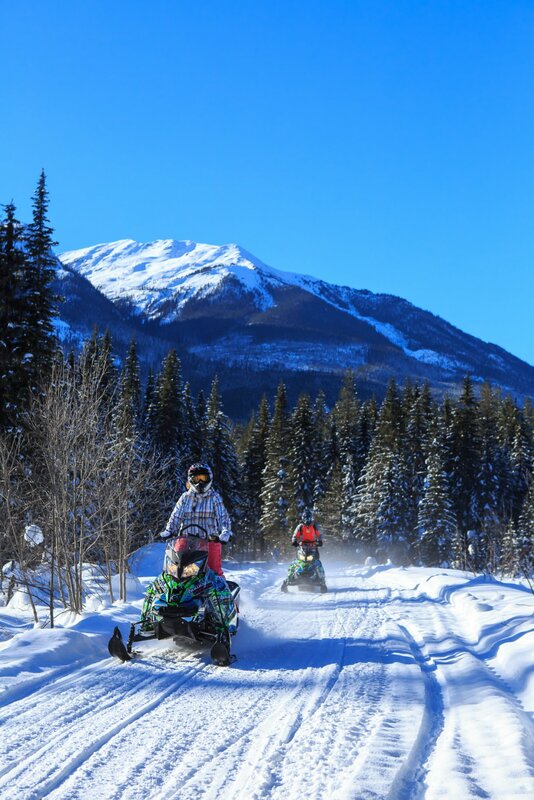 Daily trail passes are available at the ticket kiosk located on the road before the parking lots with fees set at $20 per sled for non-BCSF (British Columbia Snowmobile Federation) members and $15 for BCSF members. Yearly memberships cost $150 and are available at Mountain Motorsports and Motortech. Grooming schedules and a lot of other useful is available online at www.sledgolden.com. Don’t forget about Golden’s newest snowmobiling venture, the West Bench trail: a 45 km groomed trail that connects the Gorman lake parking lot to Quartz Creek.